The utility-scale solar sector has led the overall U.S. solar market in terms of installed capacity since 2012. In 2017, the utility-scale sector accounted for nearly 60% of all new solar capacity, and is expected to maintain its market-leading position for at least another six years. Two-thirds of all states, representing all regions of the country, are now home to one or more utility-scale solar projects. Installation and Technology Trends: The use of solar trackers dominated 2017 installations with nearly 80% of all new capacity. In a reflection of the ongoing geographic expansion of the market beyond California and the high-insolation Southwest, the median insolation level at newly built project sites declined again in 2017. While new fixed-tilt projects are now seen predominantly in less-sunny regions, tracking projects are increasingly pushing into these same regions. The median inverter loading ratio grew to 1.32 in 2017, allowing the inverters to operate closer to full capacity for a greater percentage of the day. Installed Prices: Median installed PV project prices have steadily fallen by two-thirds since the 2007-2009 period, to $2.0/WAC (or $1.6/WDC) for projects completed in 2017. The lowest 20th percentile of projects within our 2017 sample were priced at or below $1.8/WAC, with the lowest-priced projects around $0.9/WAC. Overall price dispersion across the entire sample has decreased steadily every year since 2013; similarly, price variation across regions decreased in 2017. Operation and Maintenance (“O&M”) Costs: PV O&M costs were in the neighborhood of $16/kWAC-year, or $8/MWh, in 2017. These numbers include only those costs incurred to directly operate and maintain the generating plant. Capacity Factors: The cumulative net AC capacity factors of individual projects vary widely, from 14.3% to 35.2%, with a sample median of 26.3%. This project-level variation is based on a number of factors, including the strength of the solar resource at the project site, whether the array is mounted at a fixed tilt or on a tracking mechanism, the inverter loading ratio, degradation, and curtailment. Changes in at least the first three of these factors drove mean capacity factors higher from 2010-vintage to 2013-vintage projects, where they’ve remained fairly steady among more-recent project vintages as an ongoing increase in the prevalence of tracking has been offset by a build-out of lower resource sites. 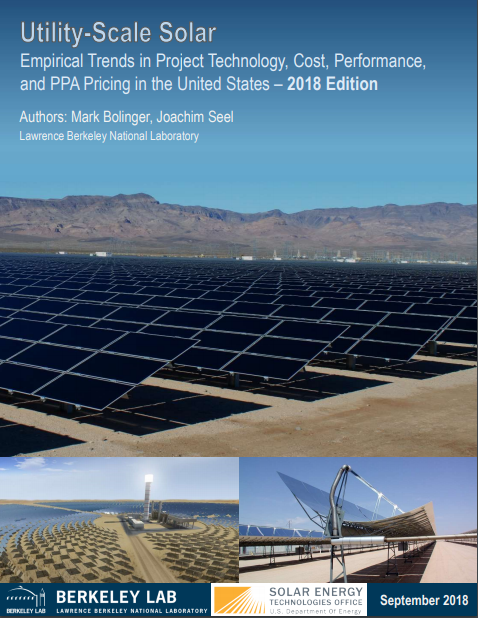 PPA Prices and LCOE: Driven by lower installed project prices and improving capacity factors, levelized PPA prices for utility-scale PV have fallen dramatically over time, by $20-$30/MWh per year on average from 2006 through 2012, with a smaller price decline of ~$10/MWh per year evident from 2013 through 2016. Most recent PPAs in our sample—including many outside of California and the Southwest—are priced at or below $40/MWh levelized (in real 2017 dollars), with a few priced as aggressively as ~$20/MWh. The median LCOE among operational PV projects in our sample has followed PPA prices lower, suggesting a relatively competitive market for PPAs. Solar’s Wholesale Energy Market Value: Falling PPA prices have been offset to some degree by a decline in the wholesale energy market value of solar within higher-penetration markets like California, where solar earned just 79% of the average price across all hours within CAISO’s real-time wholesale energy market in 2017 (down from 125% back in 2012). In other markets with less solar penetration, however, solar’s hourly generation profile still earns more than the average wholesale price (e.g., 127% in ERCOT, 112% in PJM). Solar+Storage: Adding battery storage is one way to at least partially restore the value of solar, and three recent PV+storage PPAs in Nevada (each using 4-hour batteries sized at 25% of PV nameplate capacity) suggest that the incremental PPA price adder for storage has fallen to ~$5/MWh, down from ~$15/MWh just a year ago for a similarly configured project. As PV plus battery storage becomes more cost-effective, a number of developers are regularly offering it as a viable upgrade to standalone PV. At the end of 2017, there were at least 188.5 GW of utility-scale solar power capacity within the interconnection queues across the nation. The 2017 growth within these queues is widely distributed across all regions of the country, but is most pronounced in the up-and-coming Midwest region, which accounts for 27% of the 99.2 GW of new queue capacity. The widening geographic distribution is as clear of a sign as any that the utility-scale market is maturing and expanding outside of its traditional high-insolation comfort zones. Click the webinar tab below to view a presentation about the report recorded on September 20, 2018. We want to hear from you. Please let us know if you have questions about the report or data, suggestions for ways we might improve the report or for other topics we might explore with these data, or requests for related analytical support from LBNL staff. You can submit your comments here and they will be routed to the appropriate staff.